Big thanks to the North Decatur Presbyterian Church for lending their facilities to this meeting. Close to 60 people gathered to learn about the safety audit and discuss North Decatur Road's future. This meeting was part of the North Decatur Road Safety Audit that began in July (click here for all our N. Decatur Rd. safety audit posts) and provided an opportunity for local government to respond to the audit report and for community members to ask questions and offer feedback. 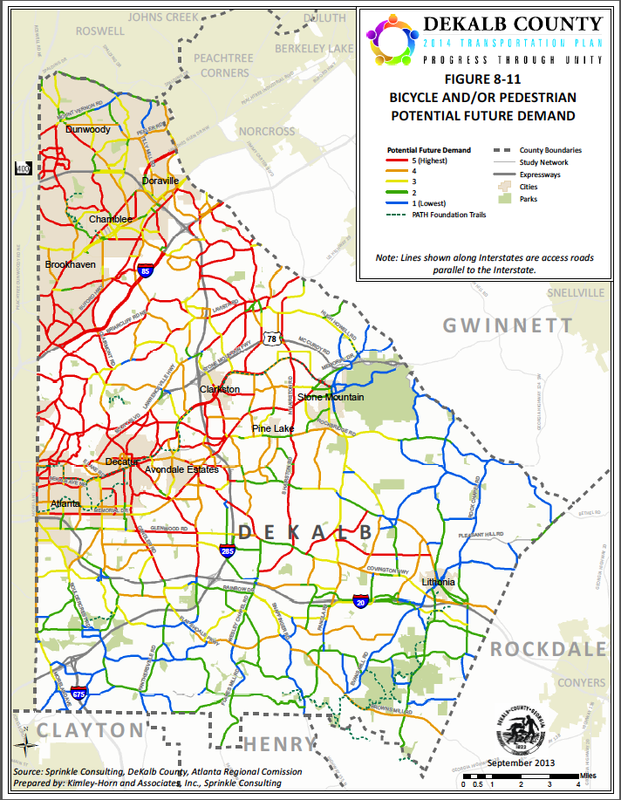 The meeting was led by Joe Greear (area resident), Rebecca Serna (Atlanta Bicycle Coalition) and Leah Yngve (Emory University's Rollins School of Health). Following an introduction and a presentation of audit findings and recommendations, Commissioner Jeff Rader, Patrece Keeter (Public Works, Transportation Division) and Peggy Allen (Deputy Director of Traffic Engineering) provided DeKalb County's response. Representatives from the City of Decatur and Emory University (Bike Emory, Emory Police), PEDS, and Commissioner Kathie Gannon's office were also present. 1) a complete street conversion ("road diet") to reduce North Decatur Road from 4 lanes to 3, by creating a center turn lane and bike lanes. Study of this option suggested. Commissioner Rader noted that North Decatur Road predates the Civil War and as the area developed, this road was designed as a residential street--with lanes for traffic and some space for residents to park in front of their homes. As the area grew and traffic increased, the road was reconfigured as a four-lane road. The presence of Emory University, CDC (and other large area employers such as the VA Hospital and DeKalb Medical) draws many people to an area that lacks direct access to large-volume highways. This is the reality that we have to work with. This audit brings the opportunity to look at "big picture" ideas but these projects are costly. Patrece Keeter shared that she has been working on our traffic and safety concerns, including working on trying to reduce the speed limit on Scott Blvd (after the Ponce de Leon section) to 35 mph vs the current 40mph (likewise for Medlock on the City of Decatur side, and for Sycamore). She shared Rebecca Serna's concerns that the complete street conversion sounds ideal but our current traffic levels may exceed that proposal's target. One of the concerns in the audit was the lack of ADA-compliant ramps and Patrece said they will do a ramp inventory, and will begin by adding them where none are available. In regards to vegetation posing visibility threats, Patrece and Peggy Allen both mentioned that the County has limited resources and the crews that do such clearings work other jobs with the County full-time; in other words, they are not landscapers and when they are called to clear an area, they will do exactly that. This can create friction because often, property owners have grown used to depending on that same vegetation bank as as a visual or sound buffer from nearby traffic. Thus, they recommend that property owners get together to discuss how to control vegetation in a manner that balances public safety and their privacy concerns then pitch in to maintain the area to their satisfaction.They can also communicate with the County to oversee more targeted vegetation control (but obviously this would require volunteers on site to coordinate with the work crews). Another innovative possibility from the audit was to improve traffic flow at the N. Decatur Road / Clairmont intersection by using Webster Dr. to route traffic from N. Decatur Road to Clairmont. This kind of approach is being used in other areas to good effect and would require new signage to educate drivers about how to navigate the area. Residents of Webster Dr. of course are concerned about increased traffic under this proposal, and Fred Boykin (owner of Bicycle South and Cit of Decatur Commissioner) noted that this area is experiencing an increase in foot traffic because more young families and children now reside in the area (Emory Woods in particular) and more people are overall choosing to walk to restaurants and grocery stores (Publix, Rainbow). Thus, (1) it makes sense to pay attention to current demographics of the area, and (2) the Webster Drive proposal would require careful study to ensure pedestrian safety and limit impact on residents. 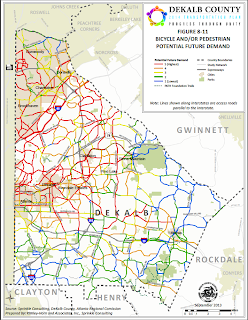 DeKalb County 2014 Transportation Plan. 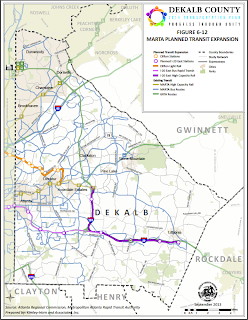 Patrece also asked everyone to visit the DeKalb County 2014 Transportation Plan website, and attend the final meetings to take place in November. The website includes a link to the existing conditions and needs assessment plan [large file, but see pdf document page 185 for discussion of the Clifton Corridor Transit Initiative]. Previous meetings narrations are available on the website as well. Technical analysis is in progress, whereby they are interconnecting this study with other area concerns (LCIs, active living, City of Decatur initiatives). The list of projects being evaluated includes pedestrian and bike improvements to North Decatur Road. One audience member asked if the County has looked into storm drainage on North Decatur Road. As is, when it rains, it really floods suddenly; drivers may hit the brakes suddenly or hydroplane, and large amounts of water are also splashed by traffic, hitting yards and pedestrians alike. Currently, water just drains into the creek. Patrece answered that if we get to the point where N. Decatur Rd. is improved, drainage would be part of the development plan. Peggy Allen added that the County's resources are limited for doing necessary improvements. For example, the County has ~2,000 miles of roads but, with a $120 million resurfacing shortfall, the budget only allowed for the resurfacing of 35 miles of roads. Patrece added that road maintenance is HOST based, so, the County splits available funds with its cities. Regarding signalized crosswalks, Peggy noted that these can be quite expensive and can be as costly as signaling for major crossings. For example, a HAWK signal costs ~$100,000; flashing beacons are less costly but also less effective. Commissioner Rader again stressed budgetary constraints and how the County will be continuing to contribute to safety by clearing vegetation and adding short stretches of sidewalk but overall, the community needs to be thinking of the big picture and big solutions that can really address the magnitude of our traffic capacity problems. I found it encouraging that the County did not immediately reject the concept of a Complete Streets conversion (aka "Road Diet") and in fact is going to study the possibility for this stretch of N. Decatur. If a Complete Streets is to be done, then the intersections of N. Decatur and Clairmont and N. Decatur and Scott need some attention. The Road Audit had some recommendations for these intersections that the County is going to review. In the short term, Jeff Rader and Patrece Keener said that the County is actively working on making the pedestrian crossings at the Scott/Medlock/N. Decatur intersection more pedestrian/bike friendly including re-striping, re-timing the walk signals, and updating the signal buttons. The County is also going to work on the existing sidewalk on the North side of N. Decatur including cutting back the vegetation and providing ADA ramps where there are none. Also in the short term, the County is going to study where to place signs on the South side of N. Decatur to warn pedestrians that the sidewalk ends ahead. There was some discussion of placing a crosswalk at Clairmont Circle so that pedestrians can cross to the North side. Jeff Rader mentioned installing a sidewalk from Landover to Superior Ave. so that pedestrians on the South Side would be able to cross from the south side to the north at a signal. The long-range solutions will require further study. 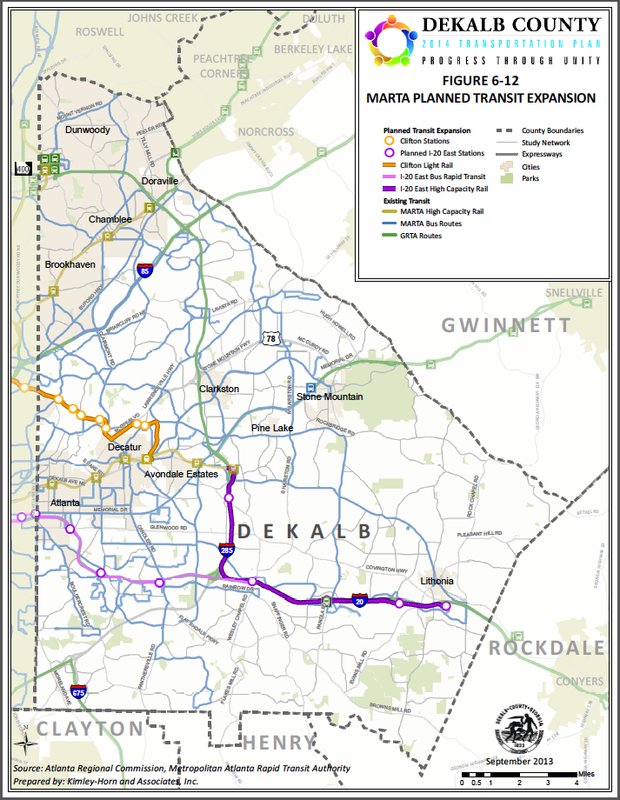 Jeff and Patrece mentioned that residents of our neighborhoods have influence of what projects are implemented by participating in the DeKalb County 2014 Transportation Plan meetings. There are meetings in November where we can help put N. Decatur on the top of the list. ADDENDUM 2: September 30, 2013. Presentation slides added. ADDENDUM 3: October 1, 2013. We encourage readers to visit DecaturMetro to join the ongoing discussion of this road safety audit. Your comments help capture concerns and suggestions that can help North Decatur Road more accessible for all. A big thanks to the individuals and organizations that have driven and continue to publicize this safety audit, and to our municipalities for being responsive.